Made for romance, this King size Honeymoon suite has a balcony which overlooks the valley with a magnificent view of the Christ of the Ozarks statue at The Great Passion Play. Room is located up above the treetops. 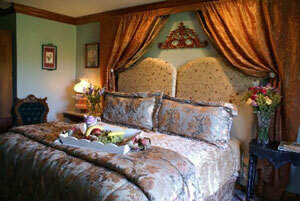 The King Jacuzzi tub is located in the Tower and has two elegant stained glass windows in the top of the tower. A King size bed adorned with designer linens, a romantic fireplace, private bath with shower and elegant oak antiques complete this room which was designed for your comfort and delight. This room, as well as the other rooms, comes with individual climate controls, ceiling fan, fresh flowers, C.D. player and TV/VCR.